Move over, slow-poke superyachts! Why putt along, when you can ZOOM? The 50-meter Trinity yacht ZOOM ZOOM ZOOM offers charter guests an excellent combination of speed, style, and versatility. She’s quick and chic – and reputed as one of the fastest U.S. builds of her pedigree. M/Y ZOOM ZOOM ZOOM is able to cruise anywhere in the world. She runs at an exceptionally fast 23 knots and cruises at 14. We love this yacht, crew and her owner. The owner is often willing to offer fantastic special rates to our clients – especially in the summertime. This summer, the superyacht will be based in New England, and to encourage more business, the owner has reduced the low-season summer (and low-season winter) rate from $180,000/wk to a competitive $165,000/wk. The yacht is 161 feet in overall length. She launched in 2005. Zoom Zoom Zoom refit in 2106. Evan K. Marshall designed the interior styling to reflect the sophisticated and elegant lifestyle of today’s luxury yacht charter client. She features an array of dining options, both indoor and alfresco. Her full-beam sky lounge is an impressive space for entertaining and the sundeck is the perfect place to relax and enjoy the views. The super yacht accommodates up to 10 guests in 5 stylish staterooms. She features a split-level master stateroom forward on the main deck, with impressive forward-facing windows that add to her beautiful exterior profile. Captain Mike Finnegan and his team are the perfect blend of experience and youth – superbly attentive to families and couples alike. The reviews and reports coming back from clients are exemplary. “ The charter was so much better than we ever hoped, the crew was so kind, they indulged the children with playing, fishing and all of the adults got into the toys and adventure as well, all of the crew participated and made it so fun, they were willing to do anything, the chef was fabulous, my wife who has Celiac and my daughter -in-law who is gluten intolerant were so spoiled and could not have been happier. In conclusion, summer is right around the corner. Secure your favorite dates and click here to BOOK NOW at https://www.1800yachtcharters.com/explore-our-yachts/zoom-zoom-zoom/book-now/ !!! News headlines from 2019 are in. The East Nusa Tenggara (NTT) administration plans to close Komodo National Park to visitors for one year. This is to stop people from stealing its famous dragons. The government plans to curb the illegal poaching of the dragons. They also want to increase the local population of Komodo dragons and deer. Deer is the primary food source for the dragons. The headlines got it wrong. Only the island of Komodo will close, not the National Park. Komodo National Park is made up of 20-plus islands. Komodo Island is one of three major islands in the park. C losing Komodo Island only means the rest of the national park remains open. No dive sites are affected by this closure. No anchorages used during Komodo yacht charter vacations are affected. 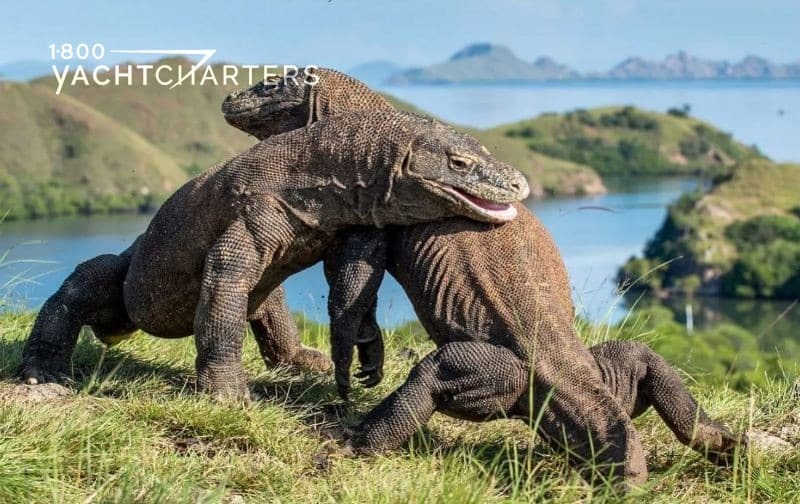 “Most Komodo dragon sightseeing tours are conducted on the smaller Rinca Island, not on Komodo Island,” states 1-800 Yacht Charters President, Jana Sheeder. Q: Should I cancel or postpone my luxury yacht vacation and avoid Komodo National Park? A: NO. The park remains open. The local economy needs your support. The dragons await your visit! Komodo National Park is located in the archipelago of Indonesia. It is a UNESCO World Heritage Site. It features three major islands. For instance, Komodo, Rinca and Padar. It also includes dozens of tiny islands spanning over 1,800 kilometers across land and sea. The area is without peer. Its environmental significance and appeal as a yachting destination are unequalled. Wildlife flourishes both on the islands and in the surrounding seas. Many of the yachts for hire in Komodo carry snorkeling gear. Some boats even offer scuba for certified divers. The reefs offer refuge for sea turtles and fish. They also attract whales, dolphins, and dugongs (manatees). There are approximately 5700 dragons inhabiting the park. The majority make their home on Komodo island. An increase in poaching and smuggling of dragons from Komdo island forces the government to take drastic action. These dragons command upwards of $35,000 each on the black market. Authorities now step in to protect the dragons. These creatures are ‘vulnerable’ on the Red List of Threatened Species. Tourists are barred from Komodo Island starting January 2020. Authorities use this time to thwart the poachers. They also do it to relieve pressure on the local environment. The goal is to allow the local dragon population to increase. This time is also to increase the island’s deer population. These deer are the primary food source for the dragons. Officials will conduct studies to determine the exact effects of tourism on the island and the park. Tourist activities such as Komodo watching, diving and snorkeling will be closely monitored throughout the park. HOW MANY PEOPLE VISIT THE PARK? According to data from the Indonesian Environment and Forestry Ministry, over 10,000 people visit Komodo National Park monthly, with 95 percent of them being foreigners, while only 130 people monitor the park. 1. Komodos are Excellent Swimmers – they often swim from island to island in search of food. 2. Komodos Can Consume 80 Percent of Their Body Weight in One Sitting. 3. Komodos Demonstrate Play Behavior. At the National Zoo in Washington, D.C dragons, “…clearly demonstrated play-like behavior with objects and even with humans (tug-of-war)…” No thanks, we’ll just observe them from afar!!! Many motoryachts like the 50m Perini Navi yacht EXUMA pass through Indonesia. The most popular yachts for hire are large, roomy sailing yachts. For instance, 65 meter LAMINA. There are 2 common itineraries for a full Superyacht Experience in Indonesia. For instance, East Nusa Tenggara Expedition (Bali – Komodo – Flores – Sumba) and Maluku Expedition (Maumere – Alor – Banda Sea – Ambon). Jana Sheeder on Will Oceanco yacht AMARA Join the Luxury Yacht Charter Fleet in 2019? Copyright © 2017 1-800 Yacht Charters. All Rights Reserved. Thank you to all of our amazing clientele for helping us deliver your superyacht experience for over 30 years. International Yacht Brokers Association. Promoting Professionalism in the Marine Industry. Member of Chartered Yacht Broker's Association, Inc. Founded 1982. Recognized by Forbes.com as the Best Private Cruise.